Virgin and Child. Wall painting from the catacombs, Rome, 4th century. The History of late ancient Christianity traces Christianity during the Christian Roman Empire - the period from the rise of Christianity under Emperor Constantine (c. 313), until the fall of the Western Roman Empire (c. 476). The end-date of this period varies because the transition to the sub-Roman period occurred gradually and at different times in different areas. One may generally date late ancient Christianity as lasting to the late 6th century and the re-conquests under Justinian (reigned 527-565) of the Byzantine Empire, though a more traditional end-date is 476, the year in which Odoacer deposed Romulus Augustus, traditionally considered the last western emperor. Christianity began to spread initially from Roman Judaea without state support or endorsement. It became the state religion of Armenia in either 301 or 314, of Ethiopia in 325, and of Georgia in 337. With the Edict of Thessalonica it became the state religion of the Roman Empire in 380. In April 311, Galerius, who had previously been one of the leading figures in the Christian persecutions, issued an edict officially ending these persecutions. After halting the persecutions of the Christians, Galerius reigned for another 2 years. He was then succeeded by an emperor with distinctively pro Christian leanings, Constantine the Great. The Emperor Constantine I was exposed to Christianity by his mother, Helena. There is scholarly controversy, however, as to whether Constantine adopted his mother's Christianity in his youth, or whether he adopted it gradually over the course of his life. Christian sources record that Constantine experienced a dramatic miraculous event in 312 at the Battle of Milvian Bridge, after which Constantine would claim the emperorship in the West. According to these sources, Constantine decided to pray to the Christian God of his father before his battle and looked up to the sun before the battle and saw a cross of light above it, and with it the Greek words "ΕΝ ΤΟΥΤΩ ΝΙΚΑ" ("by this, conquer! ", often rendered in the Latin "in hoc signo vinces"); Constantine commanded his troops to adorn their shields with a Christian symbol (the Chi-Ro), and thereafter they were victorious. 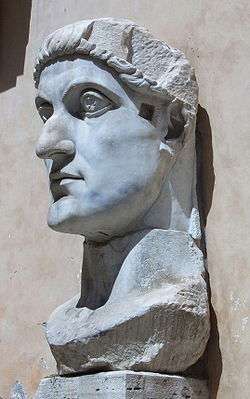 How much Christianity Constantine adopted at this point is difficult to discern; most influential people in the empire, especially high military officials, were still pagan, and Constantine's rule exhibited at least a willingness to appease these factions. The Roman coins minted up to eight years subsequent to the battle still bore the images of Roman gods. Nonetheless, the accession of Constantine was a turning point for the Christian Church. After his victory, Constantine supported the Church financially, built various basilicas, granted privileges (e.g., exemption from certain taxes) to clergy, promoted Christians to high ranking offices, and returned property confiscated during the Great Persecution of Diocletian. Between 324 and 330, Constantine built, virtually from scratch, a new imperial capital at Byzantium on the Bosphorus (it came to be named for him: Constantinople)–the city employed overtly Christian architecture, contained churches within the city walls (unlike "old" Rome), and had no pagan temples. Despite the fact that he seems to have considered himself to be a Christian during his lifetime, for reasons unknown, Constantine chose to wait until he was on his deathbed to be baptized. In 313, he issued the Edict of Milan, officially legalizing Christian worship. In 316, he acted as a judge in a North African dispute concerning the Donatist controversy. More significantly, in 325 he summoned the Council of Nicaea, effectively the first Ecumenical Council (unless the Council of Jerusalem is so classified), to deal mostly with the Arian controversy, but which also issued the Nicene Creed, which among other things professed a belief in One Holy Catholic Apostolic Church, the start of Christendom. The reign of Constantine established a precedent for the position of the Christian Emperor in the Church. Emperors considered themselves responsible to God for the spiritual health of their subjects, and thus they had a duty to maintain orthodoxy. The emperor did not decide doctrine — that was the responsibility of the bishops — rather his role was to enforce doctrine, root out heresy, and uphold ecclesiastical unity. The emperor ensured that God was properly worshiped in his empire; what proper worship consisted of was the responsibility of the church. This precedent would continue until certain emperors of the fifth and six centuries sought to alter doctrine by imperial edict without recourse to councils, though even after this Constantine's precedent generally remained the norm. The reign of Constantine did not bring the total unity of Christianity within the Empire. His successor in the East, Constantius II, was an Arian who kept Arian bishops at his court and installed them in various sees, expelling the orthodox bishops. Constantius's successor, Julian, known in the Christian world as Julian the Apostate, was a philosopher who upon becoming emperor renounced Christianity and embraced a Neo-platonic and mystical form of paganism shocking the Christian establishment. Intent on re-establishing the prestige of the old pagan beliefs, he modified them to resemble Christian traditions such as the episcopal structure and public charity (hitherto unknown in Roman paganism). Julian eliminated most of the privileges and prestige previously afforded to the Christian Church. His reforms attempted to create a form of religious heterogeneity by, among other things, reopening pagan temples, accepting Christian bishops previously exiled as heretics, promoting Judaism, and returning Church lands to their original owners. However, Julian's short reign ended when he died while campaigning in the East. Christianity came to dominance during the reign of Julian's successors, Jovian, Valentinian I, and Valens (the last Eastern Arian Christian Emperor). On February 27, 380, the Roman Empire officially adopted Trinitarian Christianity as its state religion. Prior to this date, Constantius II (337-361) and Valens (364-378) had personally favored Arian or Semi-Arian forms of Christianity, but Valens' successor Theodosius I supported the Trinitarian doctrine as expounded in the Nicene Creed. On this date, Theodosuis I decreed that only the followers of Trinitarian Christianity were entitled to be referred to as Catholic Christians, while all others were to be considered to be practicers of heresy, which was to be considered illegal. In 385, this new legal authority of the Church resulted in the first case of many to come, of the capital punishment of a heretic, namely Priscillian. In the several centuries of state sponsored Christianity that followed, pagans and "heretical" Christians were routinely persecuted by the Empire and the many kingdoms and countries that later occupied the place of the Empire, but some Germanic tribes remained Arian well into the Middle Ages). The earliest controversies were generally Christological in nature; that is, they were related to Jesus' (eternal) divinity or humanity. Docetism held that Jesus' humanity was merely an illusion, thus denying the incarnation. Arianism held that Jesus, while not merely mortal, was not eternally divine and was, therefore, of lesser status than God the Father (John 14:28). Trinitarianism held that God the Father, God the Son, and the Holy Spirit were all strictly one being with three hypostases. Many groups held dualistic beliefs, maintaining that reality was composed into two radically opposing parts: matter, usually seen as evil, and spirit, seen as good. Others held that both the material and spiritual worlds were created by God and were therefore both good, and that this was represented in the unified divine and human natures of Christ. The development of doctrine, the position of orthodoxy, and the relationship between the various opinions is a matter of continuing academic debate. Since most Christians today subscribe to the doctrines established by the Nicene Creed, modern Christian theologians tend to regard the early debates as a unified orthodox position (see also Proto-orthodox Christianity and Palaeo-orthodoxy) against a minority of heretics. Other scholars, drawing upon, among other things, distinctions between Jewish Christians, Pauline Christians, and other groups such as Gnostics and Marcionites, argue that early Christianity was fragmented, with contemporaneous competing orthodoxies. Later Church Fathers wrote volumes of theological texts, including Augustine, Gregory Nazianzus, Cyril of Jerusalem, Ambrose of Milan, Jerome, and others. What resulted was a golden age of literary and scholarly activity unmatched since the days of Virgil and Horace. Some of these fathers, such as John Chrysostom and Athanasius, suffered exile, persecution, or martyrdom from Arian Byzantine Emperors. Many of their writings are translated into English in the compilations of Nicene and Post-Nicene Fathers. Icon depicting the Emperor Constantine (center) and the bishops of the First Council of Nicaea (325) holding the Niceno–Constantinopolitan Creed of 381. During this era, several Ecumenical Councils were convened. These were mostly concerned with Christological disputes and represent an attempt to reach an orthodox consensus and to establish a unified Christian theology. The Council of Nicaea (325) condemned Arian teachings as heresy and produced a creed (see Nicene Creed). The Council of Ephesus condemned Nestorianism and affirmed the Blessed Virgin Mary to be Theotokos ("God-bearer" or "Mother of God"). Perhaps the most significant council was the Council of Chalcedon that affirmed that Christ had two natures, fully God and fully man, distinct yet always in perfect union, largely affirming Leo's "Tome." Thus, it condemned Monophysitism and would be influential in refuting Monothelitism. However, not all sees accepted all the councils, for example Nestorianism and the Assyrian Church of the East split over the Council of Ephesus of 431, Oriental Orthodoxy split over the Council of Chalcedon of 451. Emperor Constantine convened this council to settle a controversial issue, the relation between Jesus Christ and God the Father. The Emperor wanted to establish universal agreement on it. Representatives came from across the Empire, subsidized by the Emperor. Previous to this council, the bishops would hold local councils, such as the Council of Jerusalem, but there had been no universal, or ecumenical, council. The council drew up a creed, the original Nicene Creed, which received nearly unanimous support. The council's description of "God's only-begotten Son", Jesus Christ, as of the same substance with God the Father became a touchstone of Christian Trinitarianism. The council also addressed the issue of dating Easter (see Quartodecimanism and Easter controversy), recognised the right of the see of Alexandria to jurisdiction outside of its own province (by analogy with the jurisdiction exercised by Rome) and the prerogatives of the churches in Antioch and the other provinces and approved the custom by which Jerusalem was honoured, but without the metropolitan dignity. The Council was opposed by the Arians, and Constantine tried to reconcile Arius, after whom Arianism is named, with the Church. Even when Arius died in 336, one year before the death of Constantine, the controversy continued, with various separate groups espousing Arian sympathies in one way or another. In 359, a double council of Eastern and Western bishops affirmed a formula stating that the Father and the Son were similar in accord with the scriptures, the crowning victory for Arianism. The opponents of Arianism rallied, but in the First Council of Constantinople in 381 marked the final victory of Nicene orthodoxy within the Empire, though Arianism had by then spread to the Germanic tribes, among whom it gradually disappeared after the conversion of the Franks to Catholicism in 496. The council approved the current form of the Nicene Creed as used in the Eastern Orthodox Church and Oriental Orthodox churches, but, except when Greek is used, with two additional Latin phrases ("Deum de Deo" and "Filioque") in the West. The form used by the Armenian Apostolic Church, which is part of Oriental Orthodoxy, has many more additions. This fuller creed may have existed before the Council and probably originated from the baptismal creed of Constantinople. The council also condemned Apollinarism, the teaching that there was no human mind or soul in Christ. It also granted Constantinople honorary precedence over all churches save Rome. The council did not include Western bishops or Roman legates, but it was accepted as ecumenical in the West. Theodosius II called the council to settle the Nestorian controversy. Nestorius, Patriarch of Constantinople, opposed use of the term Theotokos (Greek Η Θεοτόκος, "God-bearer"). This term had long been used by orthodox writers, and it was gaining popularity along with devotion to Mary as Mother of God. He reportedly taught that there were two separate persons in the incarnate Christ, though whether he actually taught this is disputed. The council deposed Nestorius, repudiated Nestorianism as heretica, and proclaimed the Virgin Mary as the Theotokos. After quoting the Nicene Creed in its original form, as at the First Council of Nicaea, without the alterations and additions made at the First Council of Constantinople, it declared it "unlawful for any man to bring forward, or to write, or to compose a different (ἑτέραν) Faith as a rival to that established by the holy Fathers assembled with the Holy Ghost in Nicæa." The result of the Council led to political upheaval in the church, as the Assyrian Church of the East and the Persian Sassanid Empire supported Nestorius, resulting in the Nestorian Schism, which separated the Church of the East from the Latin Byzantine Church. The council repudiated the Eutychian doctrine of monophysitism, described and delineated the "Hypostatic Union" and two natures of Christ, human and divine; adopted the Chalcedonian Creed. For those who accept it, it is the Fourth Ecumenical Council (calling the previous council, which was rejected by this council, the "Robber Synod" or "Robber Council"). In November 448, a synod at Constantinople condemned Eutyches for unorthodoxy. Eutyches, archimandrite (abbot) of a large Constinapolitan monastery, taught that Christ was not consubstantial with humanity. In 449, Theodosius II summoned a council at Ephesus, where Eutyches was exonerated and returned to his monastery. This council was later overturned by the Council of Chalcedon and labeled "Latrocinium" (i.e., "Robber Council"). The Biblical canon—is the set of books Christians regard as divinely inspired and thus constituting the Christian Bible-- developed over time. While there was a good measure of debate in the Early Church over the New Testament canon, the major writings were accepted by almost all Christians by the middle of the 2nd century. In 331, Constantine I commissioned Eusebius to deliver "Fifty Bibles" for the Church of Constantinople. Athanasius (Apol. Const. 4) recorded Alexandrian scribes around 340 preparing Bibles for Constans. Little else is known, though there is plenty of speculation. For example, it is speculated that this may have provided motivation for canon lists, and that Codex Vaticanus, Sinaiticus and Alexandrinus are examples of these Bibles. Together with the Peshitta, these are the earliest extant Christian Bibles. In his Easter letter of 367, Athanasius, Bishop of Alexandria, gave a list of exactly the same books as what would become the New Testament canon, and he used the word "canonised" (kanonizomena) in regards to them. The African Synod of Hippo, in 393, approved the New Testament, as it stands today, together with the Septuagint books, a decision that was repeated by Councils of Carthage in 397 and 419. These councils were under the authority of St. Augustine, who regarded the canon as already closed. Pope Damasus I's Council of Rome in 382, if the Decretum Gelasianum is correctly associated with it, issued a biblical canon identical to that mentioned above, or if not the list is at least a sixth century compilation. Likewise, Damasus's commissioning of the Latin Vulgate edition of the Bible, c. 383, was instrumental in the fixation of the canon in the West. In 405, Pope Innocent I sent a list of the sacred books to a Gallic bishop, Exsuperius of Toulouse. When these bishops and councils spoke on the matter, however, they were not defining something new, but instead "were ratifying what had already become the mind of the Church." Thus, from the 4th century, there existed unanimity in the West concerning the New Testament canon (as it is today), and by the fifth century the East, with a few exceptions, had come to accept the Book of Revelation and thus had come into harmony on the matter of the canon. Nonetheless, a full dogmatic articulation of the canon was not made until the 16th century and 17th century. After legalisation, the Church adopted the same organisational boundaries as the Empire: geographical provinces, called dioceses, corresponding to imperial governmental territorial division. The bishops, who were located in major urban centers as per pre-legalisation tradition, thus oversaw each diocese. The bishop's location was his "seat", or "see"; among the sees, five held special eminence: Rome, Constantinople, Jerusalem, Antioch, and Alexandria. The prestige of these sees depended in part on their apostolic founders, from whom the bishops were therefore the spiritual successors, e.g., St. Mark as founder of the See of Alexandria, St. Peter of the See of Rome, etc. There were other significant elements: Jerusalem was the location of Christ's death and resurrection, the site of a 1st-century council, etc., see also Jerusalem in Christianity. Antioch was where Jesus' followers were first labelled as Christians, it was used in a derogatory way to berate the followers of Jesus the Christ. Rome was where SS. Peter and Paul had been martyred (killed), Constantinople was the "New Rome" where Constantine had moved his capital c. 330, and, lastly, all these cities had important relics. By the 5th century, the ecclesiastical had evolved a hierarchical "pentarchy" or system of five sees (patriarchates), with a settled order of precedence, had been established. Rome, as the ancient capital and once largest city of the empire, was understandably given certain primacy within the pentarchy into which Christendom was now divided; though it was and still held that the patriarch of Rome was the first among equals. Constantinople was considered second in precedence as the new capital of the empire. Among these dioceses, the five with special eminence were Rome, Constantinople, Jerusalem, Antioch, and Alexandria. The prestige of most of these sees depended in part on their apostolic founders, from whom the bishops were therefore the spiritual successors. Though the patriarch of Rome was still held to be the first among equals, Constantinople was second in precedence as the new capital of the empire. The Pope is the Bishop of Rome and the office is the "papacy." As a bishopric, its origin is consistent with the development of an episcopal structure in the 1st century. The papacy, however, also carries the notion of primacy: that the See of Rome is pre-eminent among all other sees. The origins of this concept are historically obscure; theologically, it is based on three ancient Christian traditions: (1) that the apostle Peter was pre-eminent among the apostles, see Primacy of Simon Peter, (2) that Peter ordained his successors for the Roman See, and (3) that the bishops are the successors of the apostles (apostolic succession). As long as the Papal See also happened to be the capital of the Western Empire, the prestige of the Bishop of Rome could be taken for granted without the need of sophisticated theological argumentation beyond these points; after its shift to Milan and then Ravenna, however, more detailed arguments were developed based on Matthew 16:18–19 etc. Nonetheless, in antiquity the Petrine and Apostolic quality, as well as a "primacy of respect", concerning the Roman See went unchallenged by emperors, eastern patriarchs, and the Eastern Church alike. The Ecumenical Council of Constantinople in 381 affirmed the primacy of Rome. Though the appellate jurisdiction of the Pope, and the position of Constantinople, would require further doctrinal clarification, by the close of Antiquity the primacy of Rome and the sophisticated theological arguments supporting it were fully developed. Just what exactly was entailed in this primacy, and its being exercised, would become a matter of controversy at certain later times. Christianity was by no means confined to the Roman Empire during late antiquity. Historically, the most widespread Christian church in Asia was the Church of the East, the Christian church of Sassanid Persia. This church is often known as the Nestorian Church, due to its adoption of the doctrine of Nestorianism, which emphasized the disunity of the divine and human natures of Christ. It has also been known as the Persia Church, the East Syrian Church, the Assyrian Church, and, in China, as the "Luminous Religion". The Church of the East developed almost wholly apart from the Greek and Roman churches. In the 5th century it endorsed the doctrine of Nestorius, Patriarch of Constantinople from 428 to 431, especially following the Nestorian Schism after the condemnation of Nestorius for heresy at the First Council of Ephesus. For at least twelve hundred years the Church of the East was noted for its missionary zeal, its high degree of lay participation, its superior educational standards and cultural contributions in less developed countries, and its fortitude in the face of persecution. The Church of the East had its inception at a very early date in the buffer zone between the Parthian and Roman Empires in Upper Mesopotamia, and Edessa (now Şanlıurfa) in northwestern Mesopotamia was from apostolic times the principal center of Syriac-speaking Christianity. When early Christians were scattered abroad because of persecution, some found refuge at Edessa. The missionary movement in the East began which gradually spread throughout Mesopotamia and Persia and by AD 280. While the rulers of the Second Persian empire (226-640) also followed a policy of religious toleration to begin with, they later gave Christians the same status as a subject race. These rulers encouraged the revival of the ancient Persian dualistic faith of Zoroastrianism and established it as the state religion, with the result that the Christians were increasingly subjected to repressive measures. Nevertheless, it was not until Christianity became the state religion in the West that enmity toward Rome was focused on the Eastern Christians. The metropolis of Seleucia assumed the title of "Catholicos," (Patriarch) and in AD 424 a council of the church at Seleucia elected the first patriarch to have jurisdiction over the whole church of the East, including India and Ceylon (Sri Lanka). The establishment of an independent patriarchate with nine subordinate metropoli contributed to a more favourable attitude by the Persian government, which no longer had to fear an ecclesiastical alliance with the common enemy, Rome. When Constantine converted to Christianity, and the Roman Empire which was previously violently anti-Christian became pro-Christian, the Persian Empire, suspecting a new "enemy within," became violently anti-Christian. The great persecution fell upon the Christians in Persia about the year 340. Though the religious motives were never unrelated, the primary cause of the persecution was political. "I rejoice to hear that the fairest provinces of Persia are adorned with...Christians...Since you are so powerful and pious, I commend them to your care, and leave them in your protection". It was enough to make any Persian ruler conditioned by 300 years of war with Rome suspicious of the emergence of a fifth column. Any lingering doubts must have been dispelled when about twenty years later when Constantine began to gather his forces for war in the East. Eusebius records that Roman bishops were prepared to accompany their emperor to "battle with him and for him by prayers to God whom all victory proceeds". And across the border in Persian territory the forthright Persian preacher Aphrahat recklessly predicted on the basis of his reading of Old testament prophecy that Rome would defeat Persia. It is little wonder then, that when the persecutions began shortly thereafter, the first accusation brought against the Christians was that they were aiding the Roman enemy. The shah Shapur II's response was to order a double taxation on Christians and to hold the bishop responsible for collecting it. He knew they were poor and that the bishop would be hard-pressed to find the money. Bishop Simon refused to be intimidated. He branded the tax as unjust and declared, "I am no tax collector but a shepherd of the Lord's flock." Then the killings began. A second decree ordered the destruction of churches and the execution of clergy who refused to participate in the national worship of the sun. Bishop simon was seized and brought before the shah and was offered gifts to make a token obeisance to the sun, and when he refused, they cunningly tempted him with the promise that if he alone would apostatize his people would not be harmed, but that if he refused he would be condemning not just the church leaders but all Christians to destruction. At that, the Christians themselves rose up and refused to accept such a deliverance as shameful. So according to the tradition in the year 344, he was led outside the city of Susa along with a large number of Christian clergy. Five bishops and one hundred priests were beheaded before his eyes, and last of all he himself was put to death. For the next two decades and more, Christians were tracked down and hunted from one end of the empire to the other. At times the pattern was general massacre. More often, as Shapur decreed, it was intensive organized elimination of the leadership of the church, the clergy. A third category of suppression was the search for that part of the Christian community that was most vulnerable to persecution, Persians who had been converted from the national religion, Zoroastrianism. As we have already seen, the faith had spread first among non-Persian elements in the population, Jews and Syrians. But by the beginning of the 4th century, Iranians in increasing numbers were attracted to the Christian faith. For such converts, church membership could mean the loss of everything - family, property rights, and life itself. Converts from the "national faith" had no rights and, in the darker years of the persecution, were often put to death. Sometime before the death of Shapur II in 379, the intensity of the persecution slackened. Tradition calls it a forty-year persecution, lasting from 339-379 and ending only with Shapur's death. It became the official religion of Armenia in 301 or 314, when Christianity was still illegal in the Roman Empire. Some claim the Armenian Apostolic Church was founded by Gregory the Illuminator of the late third - early fourth centuries while they trace their origins to the missions of Bartholomew the Apostle and Thaddeus (Jude the Apostle) in the 1st century. According to the fourth century western historian Rufinius, it was Frumentius who brought Christianity to Ethiopia (the city of Axum) and served as its first bishop, probably shortly after 325. The Germanic people underwent gradual Christianization from Late Antiquity. In the 4th century, the early process of Christianization of the various Germanic people was partly facilitated by the prestige of the Christian Roman Empire amongst European pagans. Until the decline of the Roman Empire, the Germanic tribes who had migrated there (with the exceptions of the Saxons, Franks, and Lombards, see below) had converted to Christianity. Many of them, notably the Goths and Vandals, adopted Arianism instead of the Trinitarian (a.k.a. Nicene or orthodox) beliefs that were dogmatically defined by the Church Fathers in the Nicene Creed and Council of Chalcedon. The gradual rise of Germanic Christianity was, at times, voluntary, particularly amongst groups associated with the Roman Empire. From the 6th century AD, Germanic tribes were converted (and re-converted) by missionaries of the Catholic Church. Many Goths converted to Christianity as individuals outside the Roman Empire. Most members of other tribes converted to Christianity when their respective tribes settled within the Empire, and most Franks and Anglo-Saxons converted a few generations later. During the later centuries following the Fall of Rome, as schism between the dioceses loyal to the Pope of Rome in the West and those loyal to the other Patriarchs in the East, most of the Germanic peoples (excepting the Crimean Goths and a few other eastern groups) would gradually become strongly allied with the Catholic Church in the West, particularly as a result of the reign of Charlemagne. In the 3rd century, East-Germanic peoples migrated into Scythia. Gothic culture and identity emerged from various East-Germanic, local, and Roman influences. In the same period, Gothic raiders took captives among the Romans, including many Christians, (and Roman-supported raiders took captives among the Goths). Wulfila or Ulfilas was the son or grandson of Christian captives from Sadagolthina in Cappadocia. In 337 or 341, Wulfila became the first bishop of the (Christian) Goths. By 348, one of the (Pagan) Gothic kings (reikos) began persecuting the Christian Goths, and Wulfila and many other Christian Goths fled to Moesia Secunda (in modern Bulgaria) in the Roman Empire. Other Christians, including Wereka, Batwin, and Saba, died in later persecutions. Between 348 and 383, Wulfila translated the Bible into the Gothic language. Thus some Arian Christians in the west used the vernacular languages, in this case including Gothic and Latin, for services, as did Christians in the eastern Roman provinces, while most Christians in the western provinces used Latin. The Franks and their ruling Merovingian dynasty, that had migrated to Gaul from the 3rd century had remained pagan at first. On Christmas 496, however, Clovis I following his victory at the Battle of Tolbiac converted to the orthodox faith of the Catholic Church and let himself be baptised at Rheims. The details of this event have been passed down by Gregory of Tours. Monasticism is a form of asceticism whereby one renounces worldly pursuits (in contempu mundi) and concentrates solely on heavenly and spiritual pursuits, especially by the virtues humility, poverty, and chastity. It began early in the Church as a family of similar traditions, modeled upon Scriptural examples and ideals, and with roots in certain strands of Judaism. St. John the Baptist is seen as the archetypical monk, and monasticism was also inspired by the organisation of the Apostolic community as recorded in Acts of the Apostles. There are two forms of monasticism: eremetic and cenobitic. Eremetic monks, or hermits, live in solitude, whereas cenobitic monks live in communities, generally in a monastery, under a rule (or code of practice) and are governed by an abbot. Originally, all Christian monks were hermits, following the example of Anthony the Great. However, the need for some form of organised spiritual guidance lead Saint Pachomius in 318 to organise his many followers in what was to become the first monastery. Soon, similar institutions were established throughout the Egyptian desert as well as the rest of the eastern half of the Roman Empire. Central figures in the development of monasticism were, in the East, St. Basil the Great, and St. Benedict in the West, who created the famous Benedictine Rule, which would become the most common rule throughout the Middle Ages. ↑ Ehler, Sidney Zdeneck; Morrall, John B (1967). Church and State Through the Centuries: A Collection of Historic Documents with Commentaries. p. 6. ISBN 9780819601896. ↑ Halsall, Paul (June 1997). "Theodosian Code XVI.i.2". Medieval Sourcebook: Banning of Other Religions. Fordham University. Retrieved 2006-11-23. ↑ "Lecture 27: Heretics, Heresies and the Church". 2009. Retrieved 2010-04-24. Review of Church policies towards heresy, including capital punishment (see Synod at Saragossa). ↑ e.g., Bauer, Walter (1971). Orthodoxy and Heresy in Earliest Christianity. ISBN 0-8006-1363-5. ; Pagels, Elaine (1979). The Gnostic Gospels. ISBN 0-679-72453-2. ; Ehrman, Bart D. (2003). Lost Christianities: The Battles for Scripture and the Faiths We Never Knew. New York: Oxford. ISBN 0-19-514183-0. 1 2 Lindberg, Carter (2006). A Brief History of Christianity. Blackwell Publishing. p. 15. ISBN 1-4051-1078-3. ↑ McDonald & Sanders' The Canon Debate, 2002, Appendix D-2, note 19: "Revelation was added later in 419 at the subsequent synod of Carthage." ↑ Council of Trent of 1546 for Roman Catholicism, the Thirty-Nine Articles of 1563 for the Church of England, the Westminster Confession of Faith of 1647 for Calvinism, and the Synod of Jerusalem of 1672 for the Eastern Orthodox. 1 2 Philostorgius via Photius, Epitome of the Ecclesiastical History of Philostorgius, book 2, chapter 5. ↑ Auxentius of Durostorum, Letter of Auxentius, quoted in Heather and Matthews, Goths in the Fourth Century, pp. 141-142. ↑ Auxentius of Durostorum, Letter of Auxentius, quoted in Heather and Matthews, Goths in the Fourth Century, p. 140. Guericke, Heinrich Ernst; et al. (1857). A Manual of Church History: Ancient Church History Comprising the First Six Centuries. New York: Wiley and Halsted. Latourette, Kenneth Scott (1975). A History of Christianity, Volume 1: Beginnings to 1500 (Revised) (paperback). San Francisco: Harper. ISBN 0-06-064952-6.